Dunes and grassland at Ards Forest Park. Bright and hot most of the day. There were a great many of these Six-spot Burnet Moths flying around at high speed. Zygaena filipendulae. Two Orchids: a very bright Pyramidal Orchid - Anacamptis pyramidalis - on the left and Fragrant Orchid - Gymnadenia conopsea - on the right. When I was a lad in Scotland, this was the 'Bluebell' - a very common species on sandy grassland. Book name is Harebell - Campanula rotundifolia. On Saturday, I mused about the red pigment of the Birdsfoot Trefoil bud. This image shows that some of it can be retained. I was delighted to find this Thyme Broomrape - Orobranche alba - growing on the face of a dune. Wild Thyme was only a metre or so away. 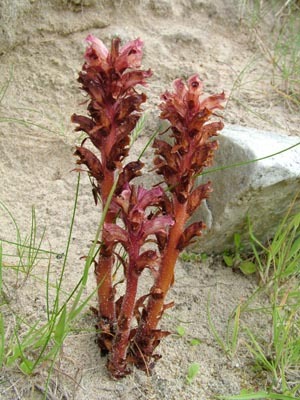 The Broomrapes are parasitic plants that don't make any food for themselves and hence have no need for chlorophyll, so there is no green on the plants. Lastly for today, Yellow Rattle - Rhinanthus minor.